7 Awesome Stats from NFL Week 12 - Fantasy Football, Fantasy Football Rankings | Mac Bros.
Week 12 of the NFL season has nearly come and gone. Let's look back at 7 feats of statistical awesomeness. 1. Arizona’s BEANIE WELLS rushed for a franchise-record 228 yards and averaged 8.4 yards per carry and Tennessee’s CHRIS JOHNSON had 190 rushing yards with an 8.3-yard average. It marked the fifth time in NFL history in which two players rushed for at least 190 yards and averaged 8.0+ yards per carry on the same day. The other four instances: December 16, 1956 (TOM WILSON and RICK CASARES), November 15, 1959 (BOBBY MITCHELL and JOHNNY OLSZEWSKI), October 14, 2007 (ADRIAN PETERSON and LADAINIAN TOMLINSON) and September 20, 2009 (FRANK GORE and Johnson). 2. The Arizona Cardinals at St. Louis Rams game is the first game in NFL history in which each team had an 80+ yard punt-return touchdown. St. Louis’ NICK MILLER had an 88-yard punt-return touchdown in the first quarter and Arizona’s PATRICK PETERSON recorded an 80-yard PR-TD in the third quarter. 3. The CINCINNATI BENGALS erased a 17-7 halftime deficit to defeat Cleveland 23-20. It marked Cincinnati’s third win this season in which the Bengals trailed by at least 10 points at halftime, tied for the most in a season in NFL history. The other teams to accomplish the feat are the 1980 Kansas City Chiefs, 1984 New England Patriots, 1986 Indianapolis Colts and the 2011 Detroit Lions. 4. New England quarterback TOM BRADY passed for 361 yards and three touchdowns in the Patriots’ 38-20 win at Philadelphia. It marked Brady’s 119th regular-season victory as a starting quarterback, tying Pro Football Hall of Famer JOHNNY UNITAS for the sixth most in NFL history. 5. Arizona rookie PATRICK PETERSON had an 80-yard punt-return touchdown in the Cardinals’ 23-20 win at St. Louis. 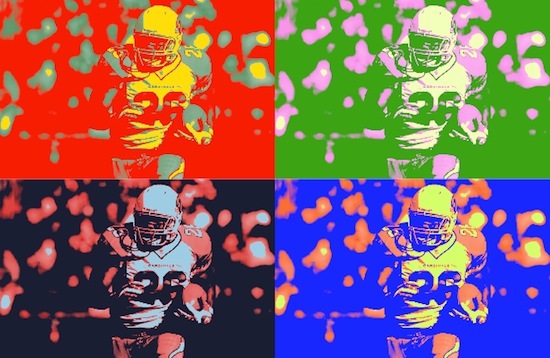 Peterson is the first player in NFL history with four punt-return touchdowns of at least 80 yards in a single season. His four punt-return touchdowns are tied for the most in a single season with Pro Football Hall of Famer JACK CHRISTIANSEN (1951), RICK UPCHURCH (1976) and DEVIN HESTER (2007). Peterson and Christiansen are the only rookies to accomplish the feat and the only players in NFL history to score four punt-return touchdowns in their first 11 career games. 6. Houston wide receiver ANDRE JOHNSON reached 700 career receptions in the Texans’ 20-13 win at Jacksonville. Johnson recorded his 700th catch in his 120th career game, the second-fewest to reach the milestone in NFL history (MARVIN HARRISON, 114 games). 7. Carolina rookie QB CAM NEWTON had a 14-yard touchdown run in the Panthers’ 27-19 win at Indianapolis. Newton has rushed for 10 touchdowns and is the fourth quarterback – and only rookie QB – in the Super Bowl era to rush for at least 10 TDs in a single season. He joins STEVE GROGAN (1976, 12), KORDELL STEWART (1997, 11) and DAUNTE CULPEPPER (2002, 10) as the only quarterbacks to accomplish the feat.